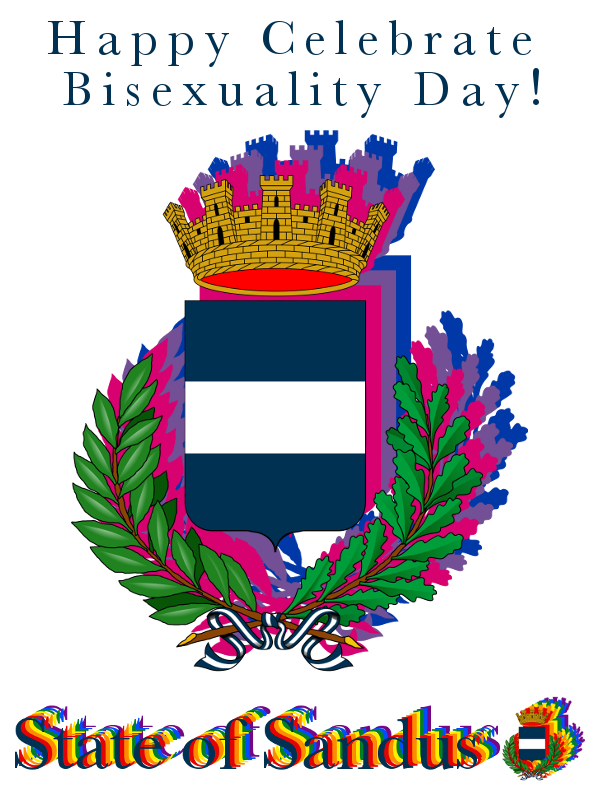 For the first time, Celebrate Bisexuality Day has been commemorated here in the State of Sandus on XXIII Septembro (23 September), a year after it was officially added to the State of Sandus’ holiday calendar. Originally added to the holiday calendar in protest of New Israel’s public anti-LGBT stance at the time, Sandus has celebrated the bi* community within the State of Sandus — from peregrae to the Sôgmô himself. Celebrate Bisexuality Day became an international LGBTQ+ holiday in 1999, a year after the bisexual community proclaimed the pink-purple-blue flag to be the bisexual flag. Fifteen years later, bisexuals continue to celebrate their only bi-specific holiday and mark it with events. Recently, the well-known LGBTQ+ organisation the Human Rights Campaign joined together with bi-specific organisations – BiNet USA, Bisexual Resource Center, and Bisexual Organising Project – to release a ground-breaking report on bisexuality and LGBTQ+ youth.